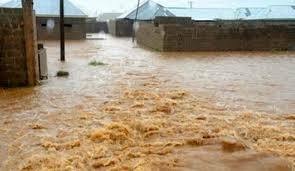 About 150 houses have been submerged in flood in Makurdi, Benue State after a six-hour downpour that lasted till the early hours of Friday. Among the areas badly hit by the flood were Demekpe, Wadata Rice mill, Agboughoul village, Mobile Barrack, Achusa village and Logo areas of the town. The flood which submerged several houses in the affected areas also swept away property of many families who were seen battling to save whatever they could rescue from the flood waters. One of the victims of the devastation, in Rice Mill area and a father of three, James Ojudu told Saturday Vanguard that the flood took them by surprise, stressing, “we were actually not prepared for this, because we’ve not had serious rainfall in Makurdi since this year. The National Emergency Management Agency (NEMA) had alerted the state governments and communities along Benue River of possible flooding following information received from Cameroonian authorities to release excess water from Lagdo Dam.